Since alphabets are the primary tools of “fixing” a language, and given our present knowledge of the evolution of letters since their inception, we can only speculate about the beginnings of hieroglyphic and cuneiform scripts for keeping records of events, and later, the transition into using one symbol for each phonetic sound. We know very little about the beginnings and the evolution of Phoenician, Greek, Latin, or Aramaic characters, the prototypes of most modern scripts and languages. The fixed/written aspect of a language is unaffected by theories of linguistic evolution, whether we accept the hypothetical theory of the wave originating in central Europe and reaching Armenia, based on the narrative of Greek historians who tell the story of the descendants of Jason and the Argonauts, the Thraco-Phyrigian tribes giving their language to the inhabitants of the indigenous people of the Armenian plateau, or the theory of the Proto Armenian language that evolved by incorporating elements of other indigenous languages (Hittite, Hurrite, Luwian, Akkadian, Summerian) to pave the way for the Armenian language. from Urartean to Old Persian. The Urartians left spectacular cuneiform inscriptions on the steep rocks that rise beside the lake of Van, recording the victories achieved by their kings. Similar surviving texts also were discovered in the Ararat plain near Erevan, in modern Armenia. 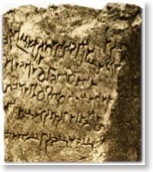 By the turn of the 7th century BC, inhabitants of the Armenian plateau had ceased to use the cuneiform alphabet, which had been superseded by more flexible and functional alphabets, notably Aramaic (the official language by which Achaemenian Persia communicated with nearby peoples), which possessed its own script, as Greek had from the Hellenistic period. Fragmented archeological evidence demonstrates that Armenians, prior to the invention of their own alphabet, used different letters as means of communication--Syriac, Greek or Aramaic--depending on the geopolitical circumstances over a period of twelve centuries (800 BC-400 AD). However, there is little surviving evidence of a dominant pattern of reliance on one alphabet or script. In stark contrast, the creation of Armenian letters stands out as an illumination of at least one form of linguistic evolution. 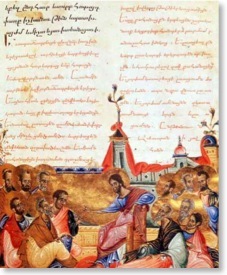 Not only the creation, but also the implementation of the Armenian alphabet on a relatively large scale for its time, remains a unique event in linguistic history. The creation of the alphabetical tools to “fix” Armenian is known in exceptional detail, including the circumstances of the birth of the letters and their subsequent impact on Armenian language and literature. There is nothing speculative about the circumstances and the historical role played by Mesrob Mashdotz in creating the Armenian alphabet (circa 401 AD). Another certainty is the presence of Armenians as a distinct ethnic and social group and their homeland as a geographical designation, Armenia. The official conversion of the Armenians to Christianity in the early years of the fourth century solidified an Armenian national identity despite the division of Armenian geographical territory between the Roman/Byzantine and Persian empires (387 AD). While the Armenian king Vramshabouh owed his crown to the non-Christian Persian king, the nobility--the king included--felt itself an integral part of the family of Orthodox Christians of the East (Byzantine) and South (Syriac). Although Christianity was proclaimed the official religion of Armenians in 301 AD, the actual spread of the new religious doctrine was extremely slow. Sahag, the Catholigos, (head of the Armenian Church), had overseen a vast enterprise to confiscate and destroy the pagan temples and build new places of worship available to the population. Yet, complicating the difficult task of spreading the new faith was the way the Scriptures--written in Greek and Syriac--had to be interpreted for the population. Mesrob Mashdotz was keenly aware of this and laments the fact that “his brothers and kinsmen” could not be receptive to the message of salvation in their own language, Armenian. Tarkmanichk (translators) and Verdzanoghk (interpreters) were used to read in Syriac or Greek and translate the scriptures into Armenian. This methodology of spreading and teaching the new religion had several major shortcomings. Qualified interpreters and translators were difficult to find, and the effort was a costly enterprise for the newly established church. Large sums had to be invested to send Armenian scholars to study in foreign countries to learn the Biblical languages and methods of teaching and spreading Christianity. This situation was further complicated by the fact that the trained translators or interpreters were liable to interject their own “version” or understanding of the new religion. This method of teaching was not uncommon in Asia Minor and the Middle East. Hebrews were faced with a situation that was the reverse of that of the Armenians, although the challenges were similar: The Judaic Diaspora had Scriptures in their own language, but that language was no longer understood by them, dispersed, as they were, throughout the Middle East; Armenians understood their own language but could not understand Greek or Syriac. Against this background, King Vramshabouh and Sahag, the Catholigos, upon recommendation by Mesrob Mashdotz, acted decisively. 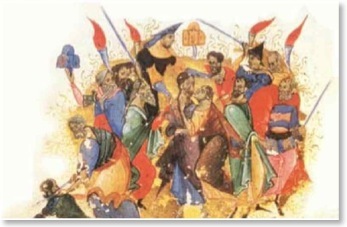 A detailed account of the ensuing events is narrated by Gorune, a student of Mesrob Mashdotz and later a close collaborator, in Life of Mashdotz, written in the second half of the 5th century. This text is valuable historically even though many of its details remain speculative. It indicates the creation of the Armenian alphabet between 397 and 425 AD, with the year 401 seeming the most plausible. The form of the work is interesting in itself, representative of the sophistication of early Armenian texts. Life of Mashdotz is an encomium; a book of tribute rather than biography or history as we know it today. As a learned scholar at Samosata, and later, Constantinople, Gorune was familiar with the principals of encomiastic prose of Georgias of Leontini, Isocrates as well as the Ciceronian principles for composing encomia. Gorune’s Life of Mashdotz, however, takes a religious turn that would become a feature of future saints’ lives. In describing the return of Mashdotz to Armenia with the newly created alphabet, for example, Gorune writes, “even the magnificent Moses was not as happy when he descended from Mount Sinai.” In Gorune’s imagination the two events had real similarities. In Life of Mashdotz, on several occasions he refers to the Armenian letters as “Asdvadzadour,”--given by God. Divine intervention made the new letters of the Armenian alphabet appear in order to facilitate the translation of God’s words--the Bible--into Armenian. For Gorune and his contemporaries, this endeavor was primordial to the salvation of the Armenians. The original 36 characters, conceived by Mashdotz, began an unprecedented movement. The resources of the kingdom of Armenia, both human and financial, were mobilized. Students were recruited to learn the new letters, and ultimately to teach them to others. Other groups of scholars were dispatched to other countries to study and bring back copies of the works of non-Armenian authors to be translated into Armenian. This enterprise gradually transcended religion and included texts dealing with science, medicine, astronomy and mathematics. Ultimately, the fifth century came to be known as the Golden Age of Armenian literature.